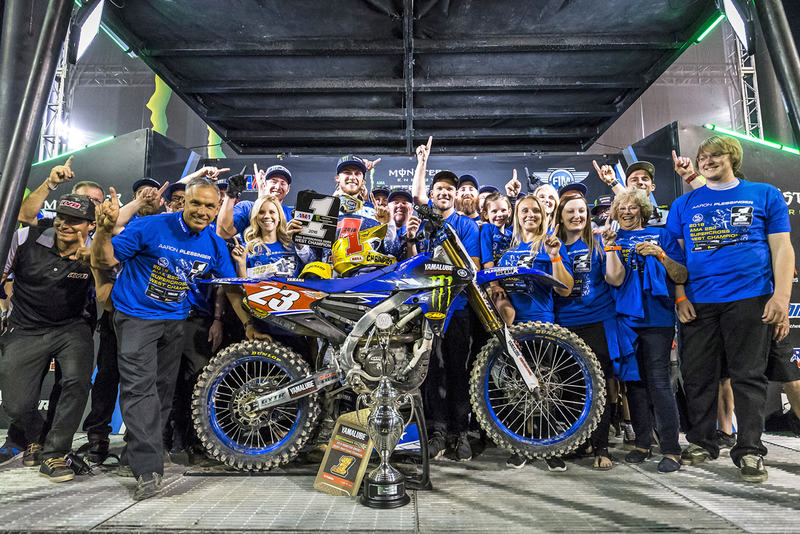 May 15, 2018– On May 5, 2018 at the finale of the 10-round AMA Supercross 250SX West Championship season held in Las Vegas, Nevada, Monster Energy/Yamalube/Star/Yamaha Racing’s Aaron Plessinger won his first-ever championship, clinching the title aboard the YZ250F. Plessinger made his AMA debut in the 250SX West class in 2015, taking an impressive 5th overall in his rookie season. In 2016, he switched to the 250SX East class and notched up his first win on his way to 2nd overall. Returning to the 250SX West class last season, he finished 3rd in the rankings, demonstrating steady progress and cementing his status as a frontrunner. The 2018 season saw him finish on the podium in the opening round with 2nd, which he followed up by taking his first victory of the season at Round 2, giving him the red number plate as the overall points leader. He placed 6th at the next round, but then took back-to-back wins in Glendale and Oakland to bring him back to the top of the standings. Plessinger was on the top step again at Round 8 in Seattle before coming into the final round in Las Vegas with a 13 point lead over 2nd. In the final round, Plessinger fell behind at the start and came across the line in 11th after the first lap, but he recovered to 8th in the early stages of the race. While there were some moments where he could have crashed, once his main championship rival took over the lead, Plessinger kept his position and a cool head and brought his bike home in 8th, enough to best his rival by 2 points and take the 250SX West title in solid style. In the premier 450SX class, the Monster Energy/Yamaha Factory Racing Team’s Cooper Webb finished 9th overall　after missing several rounds due to injury while his teammate Justin Barcia finished 10th, the Floridian also missing several rounds mid-season due to injury. In the 250SX East class, Luke Renzland took his first-ever podium at Round 6 and placed 5th overall.